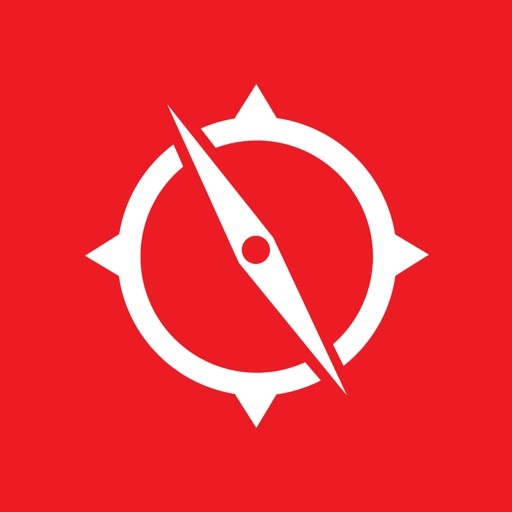 VZ Navigator App Data & Review - Navigation - Apps Rankings! Try the all new VZ Navigator FREE* for 30 Days and then pay only $4.99/month thereafter, or use it when you need it for just $0.99 for 24 hours of use. 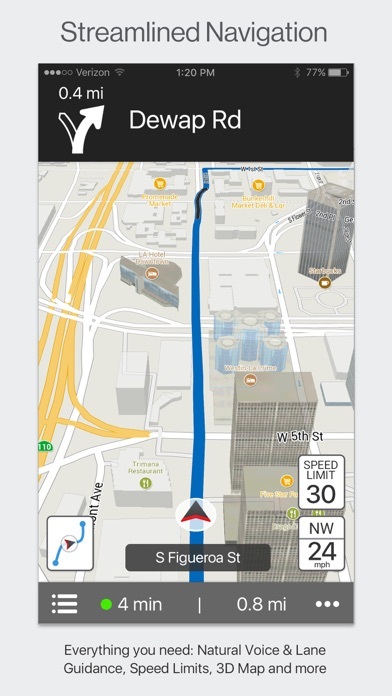 VZ Navigator is a premium navigation application that provides the most complete, accurate, and easy-to-use navigation assistance available. Enhanced 3D maps, intuitive local search and natural turn-by-turn voice guidance get you to your destination quickly and efficiently. Advanced features such as Doppler weather radar, gas prices, and movie showtimes give you valuable information to help save time and money. With a focus on optimizing the user experience, the map has been totally redesigned. Every feature, from the advanced gestures and unified color scheme to the high-fidelity landmarks and transparent 3D buildings has been expressly composed to balance simplicity and capability. 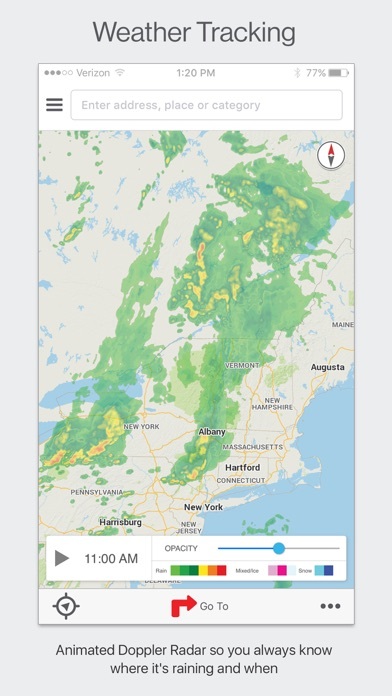 Customizable map layers include real-time traffic, satellite view, Doppler weather radar, and favorites. Search has been enhanced and is now better than ever. With TripAdvisor ratings and reviews integrated into points of interest, choosing local places to visit is a snap. With our improved Gas Station search, effortlessly view and compare all nearby stations and prices on the map. Our Movie search has also been overhauled to be easier to use, whether you’re just browsing or looking for specific movie or theater. Additionally, you can add any store brand or place category to your Explore panel, allowing one-tap to find your favorite places no matter where you go. Helping you confidently and safely maneuver around streets and highways on your journey is our primary goal. Visual & Voice Lane Guidance and Realistic Highway Signs ensure you’re always in the right place at the right time while preparing for maneuvers. Natural Voice Guidance provides references to real-world landmarks like stop signs and traffic lights to help you make turns with confidence. Our navigation experience has been refreshed with real-time traffic integrated into your route, along with one-touch access to your upcoming maneuvers and route overview. Plus, take advantage of our customizable Speed Limits & Alerts to stay safe – and possibly even avoid a ticket. *Offer valid for new VZ Navigator subscribers. Limited time offer. Customer will automatically continue with the $4.99 monthly subscription after the 30 day trial period ends. Unsubscribe anytime using the “My Account” menu option in the app or by calling 1.800.922.0204 within 30 days of downloading the app to avoid being charged. 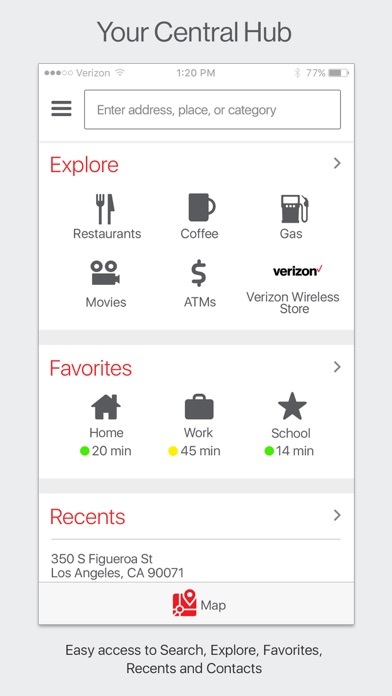 The applications VZ Navigator was published in the category Navigation on 2011-02-09 and was developed by Verizon Wireless. The file size is 89.76 MB. The current version is 10.7.70.30 and works well on 8.0 and high ios versions. Do you like VZ Navigator applications? Please share! Don’t know what is going on with this app. Used to be great for a long time. Previously I would have given it 5 stars. Didn’t mind paying $5 a month because it was worth it. Lately it takes forever to get going and seems to have a lot of problems. Looks like it’s time for me to find a different navigation app. I discovered this service charging me $5 a month so I tried to remove it. The app refuses to access my account so I can’t disable it. It says the servers are not responding. The online Verizon site doesn’t give the option to remove the service, even when the FAQ says it can. Is it an old app Verizon forgot to upgrade, or is it just another fee scam to tack a charge onto my bill? Same result either way. Used this app for at least 10 years. Used to be by far the most reliable GPS out there and didn’t mind paying $5 a month even when there were free options. But since getting the iPhone X it crashes constantly. Takes 2-3 times to find your location. Have to restart constantly. When it works it works well but are they kidding?!? In an era of multiple totally free options this needs to be spectacular to warrant the cost!! It probably would be a top contender 12 years ago. The voice directions sounds like they were made with a Speak & Spell. The only good thing for it is, in CT and NY we have small highways, (Parkways) NO commercial vehicles. I’m not driving a big rig, just a commercial van and will get a ticket on those roads. This will let you chose truck routes and it did bypass the Parkways. However: It was constantly confused or changed it’s mind/route. It showed to take the next exit including the highway sign but just as you were about to go that way it then showed to correct exit that was 6 miles down the highway!! Also sent me past the location I was going to twice today. Dropped it the first day. Back to IOS Maps and looking for something with the truck option. 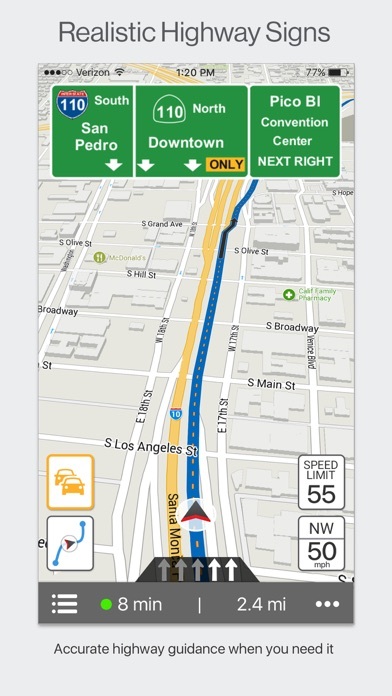 This used to be my go to navigation app. But in the last year or so I canNOT rely on it to connect to the server and give me directions. Had to start using other navigation apps on a regular basis.